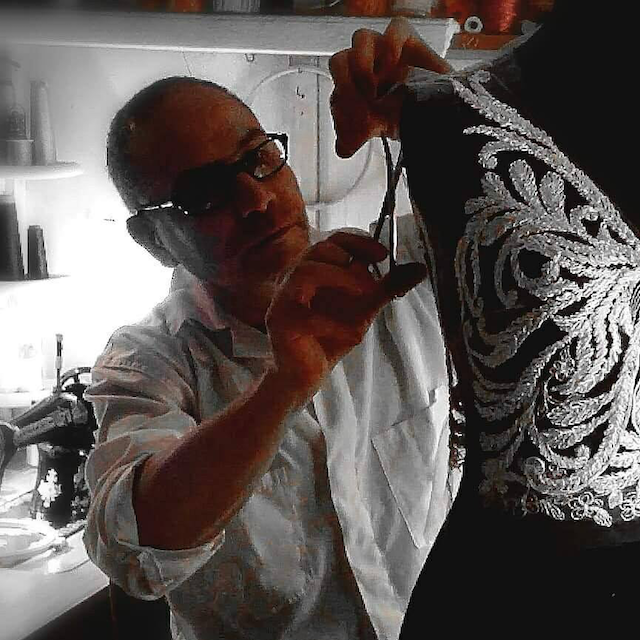 For all of you who are following the group Haute Couture Embroidery on Facebook, the name of Marco Jerez will ring a bell. 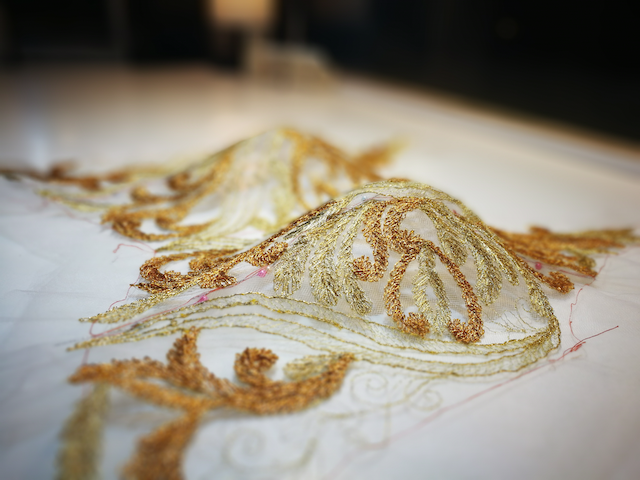 He is one of the most admired contributors in this group, where he shares his whereabouts in haute couture embroidery. Not often do we see that professionals in the field of fashion and technology so openly share their knowledge and inspiration. Marco Jerez however, is one of them. I am honoured to announce that Marco will come to the Netherlands in May 2017. During two 3-day Masterclasses he will share his insights on the matter of his distinctive technique ‘al aire’ in the atelier of Saskia ter Welle. In a small and personal setting -maximum eight students per masterclass- you will be able to see the master at work. The Masterclass will be open to anyone interested in learning the technique. Marco Jerez studied Design in the Arts of Representation at the University of Chile. From a very young age he decided to practice in the Haute Couture area where he specialized in embroidery techniques, in particular in the technique “al aire” (on the air), developed since 1935 and already in the process of extinction. With more than 24 years in the heading of Haute Couture, his works have been required by the most important Chilean brands of Haute Couture, as well as in Opera and Ballet; Some of them are exhibited in museums abroad. 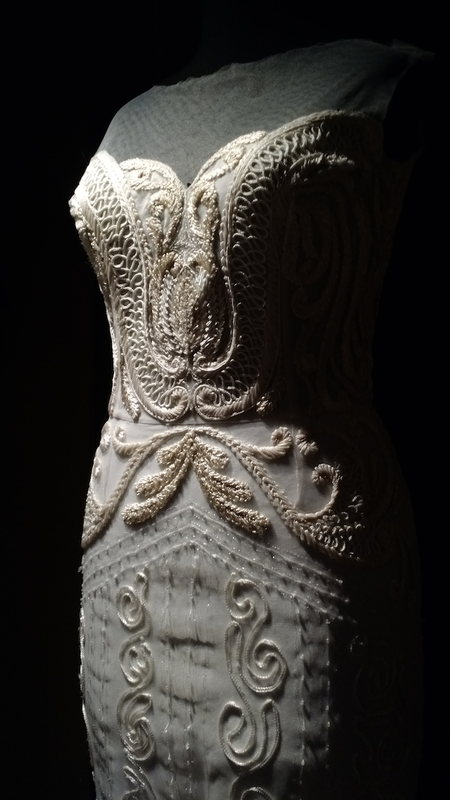 It has the only Haute Couture embroidery atelier with this technique in Chile. Along with the industrial revolution also came the development of the sewing machine. 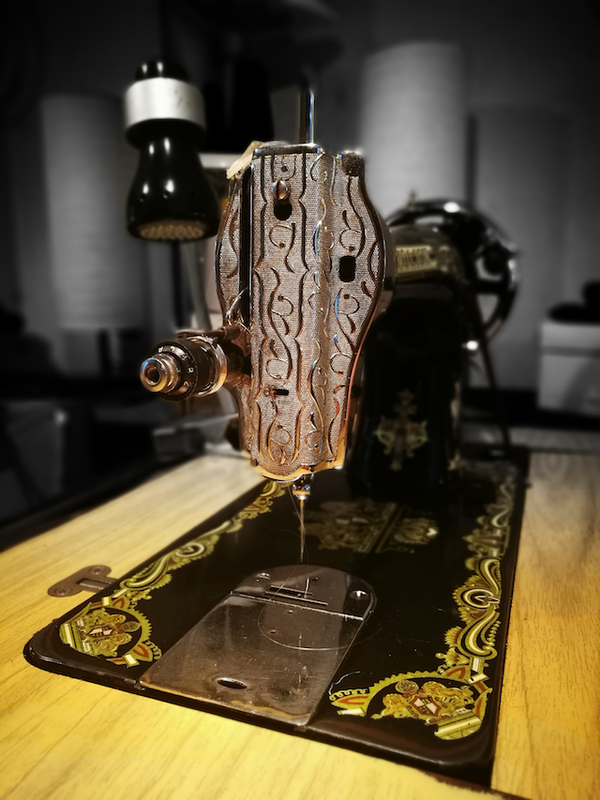 Years later, in the decade of 1930 it begin to appear sewing machines with foot pedal of different marks. Along with this, as a sales tactic, certain embroidery techniques were invented, since prior to that, the machines were only destined to sew straight. The technique consists in the use of a frame that is affirmed with both hands because they are released thanks to the replacement of the old machine cranks by the new foot pedal. Because of this there was an explosion and worldwide diffusion, and the technique became very popular among the people who acquired the machines. Many countries took this technique into their basic education program in public technical schools. Subsequently, along with the development of machines with oriental technology, which replaced all the manual process of the technique “al aire”, they began to manufacture beautiful embroidery for hundreds of meters at a much cheaper price. The technique “al aire” was gradually disappearing, to the point of almost not existing. Today this technique is practically eradicated from Europe. 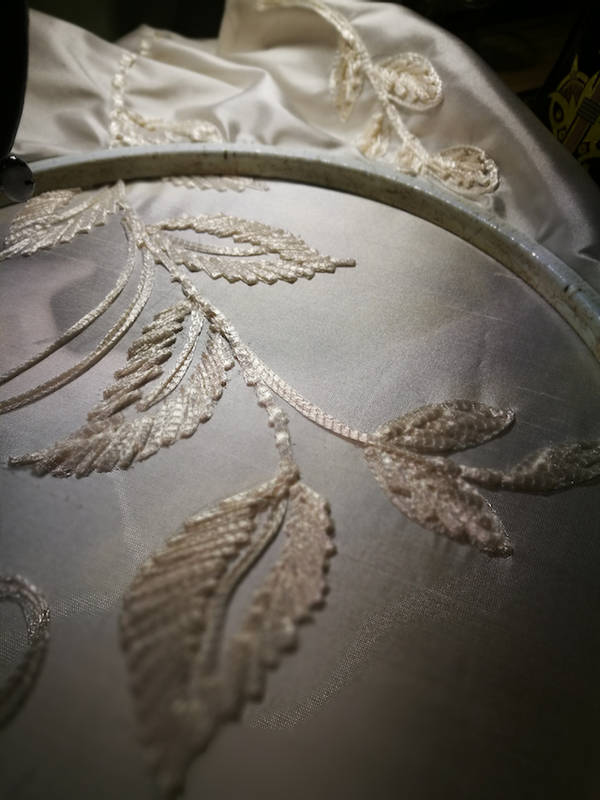 Although it is true, with the technique “al aire” one can sew sequins, pearls and crystals, besides richelieu; the conservation of the technique is drifted more towards the embroidery of threads. Basically it is a matter of pedaling with the feet, moving the frame with the right hand and embroidering with the left hand using different textile materials to achieve rich fabrications of new textiles and inimitable textures (things that automatic machines still can not do ). 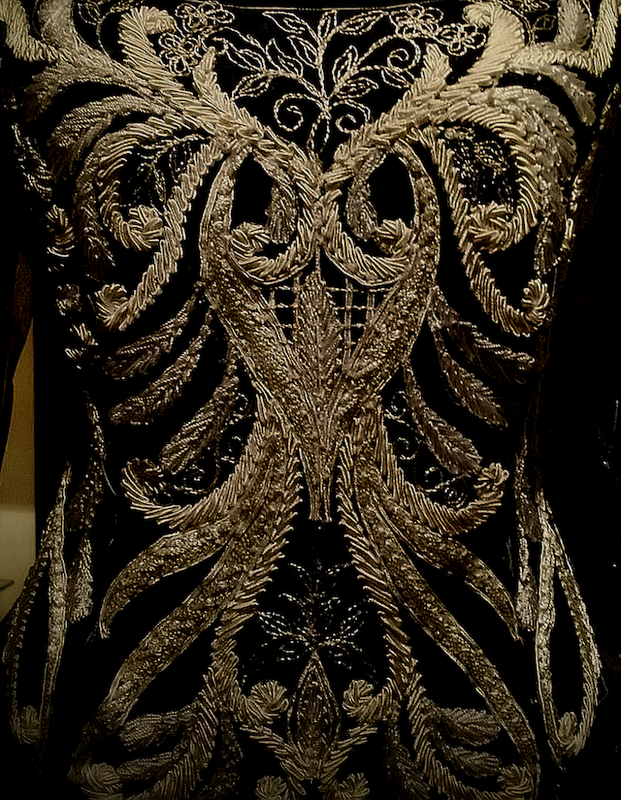 This technique is one of the most recommended to embroider clothes and haute couture for its high artistic and artisanal value. 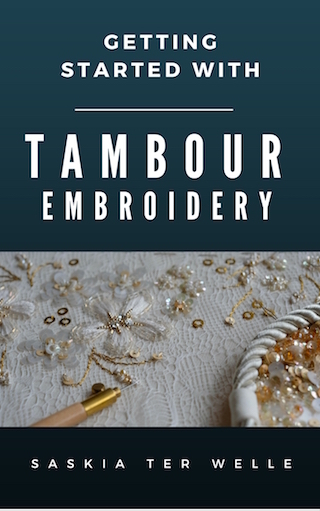 The goals and objectives of this 3-day Masterclass will be to provide the student with basic techniques and knowledge for the preparation of embroidery with technique “al aire” in thread, cord, soutache and other materials. 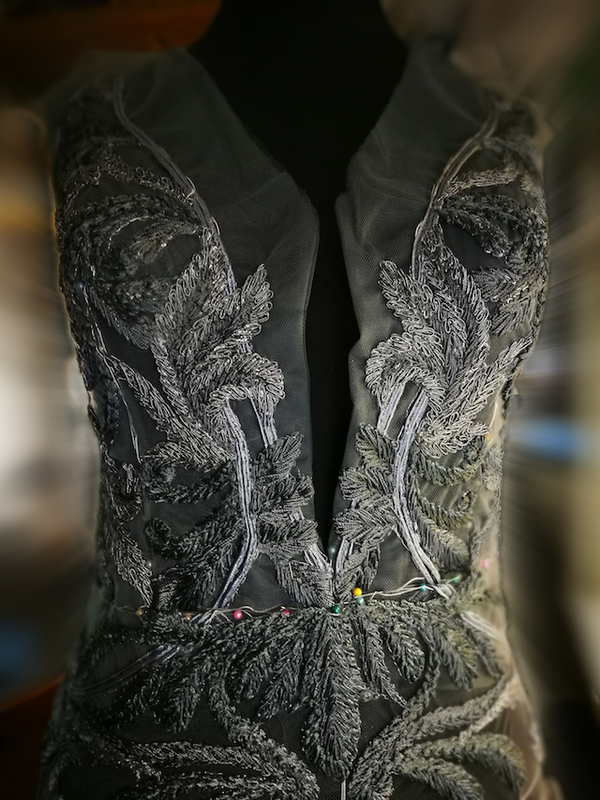 If you are already a costume designer, this course can add even more value to your work, since embroidery is an iconic element of fashion, it is also very versatile and adaptable to any trend. The Masterclass will be given in the atelier of Saskia ter Welle, Gasthuisstraat 16, 6981 CS in Doesburg, the Netherlands. Doesburg offers many ways for accommodation (including a B&B above the atelier) and we can help anyone travelling from far or even abroad to find appropriate accommodation in the vicinity of the atelier. There will be two identical Masterclasses. Especially for those of you with tight schedules, we offer a course in the weekend. The course days start at 9.30 AM with coffee or tea. We will work until lunchtime, share a fresh meal together and finish at about 16.30 PM. Coffee, tea and lunch are included. The Masterclass will be open to anyone interested in learning the technique. For this technique we depend on working on an old foot-pedal sewing machine like you see in the picture above. It would be marvellous if you could take one with you. However, we will provide some machines as well. Taking your own machine will secure your time working on the machine, while in case you use ours, you might have to share it. I know a guy who can fix old machines. If you are interested, send me a message and I will give his phone number. Old machines are easily availabe at Marktplaats.nl. If you are looking for one, make sure it uses needles with a flat back, and a ‘normal’ bobbin (thread). The investment for this course is only 495 Euros for three days. Language spoken will be English. In mei komt Marco Jerez, haute couture borduur expert uit Chili, twee exclusieve masterclasses verzorgen in het atelier van Saskia ter Welle in Doesburg. Marco is opgeleid aan de Universiteit van Chili en heeft zich al jaren gespecialiseerd op het gebied van haute couture borduurtechnieken, en in het bijzonder de techniek ‘al aire’. Hierbij worden met een ouderwetse trapnaaimachine draden en koorden op tule geborduurd. Marco werkt in opdracht van couturiers. Zijn werk wordt wereldwijd bewonderd en sommige van zijn werken zijn opgenomen in de collecties van musea. Ik voel mij vereerd met zijn komst en zie enorm uit naar deze masterclasses! Ook jij kunt erbij zijn. Geef je dan NU op, want er is maar zeer beperkt plaats. De Masterclasses staan open voor iedereen die in deze techniek is geïnteresseerd. Voertaal tijdens de cursus is Engels. Laat je hierdoor niet weerhouden om te komen. Alleen al kijken hoe Marco aan het werk is, zal verhelderend zijn. Daarnaast kunnen mensen om je heen altijd helpen met vertalen. This course is an activity of Fashion Academy Saskia ter Welle. By inviting fashion professionals from all over the world we create an inspiring environment where knowledge and a true passion for fashion and craftsmanship are being shared. Graag zou ik bij de masterclass van Marco willen zijn . Zijn hier kosten aan verbonden, zo ja hoeveel . Het lijkt me geweldig erbij te zijn , maar welke datums dat weet ik nog niet . In het verhaal hierboven vind je alle gegevens! Lees de tekst even goed door. Je kunt je via de links ook in de webshop aanmelden.